A new insurance policy expects patients to diagnose themselves. Brittany Cloyd was doubled over in pain when she arrived at Frankfort Regional Medical Center’s emergency room on July 21, 2017. “They got me a wheelchair and wheeled me back to a room immediately,” said Cloyd, 27, who lives in Kentucky. Cloyd came in after a night of worsening fever and a increasing pain on the right side of her stomach. She called her mother, a former nurse, who thought it sounded like appendicitis and told Cloyd to go to the hospital immediately. The doctors in the emergency room did multiple tests including a CT scan and ultrasound. They determined that Cloyd had ovarian cysts, not appendicitis. They gave her pain medications that helped her feel better, and an order to follow up with a gynecologist. A few weeks later, Cloyd received something else: a $12,596 hospital bill her insurance denied — leaving her on the hook for all of it. Health insurance coverage guides and bills belonging to Brittany Cloyd. Cloyd has her health insurance coverage through her husband’s job. His company uses Anthem, one of the country’s largest health insurance plans. In recent years, Anthem has begun denying coverage for emergency room visits that it deems “inappropriate” because they aren’t, in the insurance plan’s view, true emergencies. The problem: These denials are made after patients visit the ER, sometimes based on the diagnosis after seeing a doctor, not on the symptoms that sent them, like in Cloyd’s case. The policy has so far rolled out in four states: Georgia, Indiana, Missouri, and Kentucky. The Anthem letter goes on to list “stroke, heart attack, and severe bleeding” as examples of medical conditions for which ER use would be acceptable. Anthem’s new policy mirrors similar recent developments in state Medicaid programs, which increasingly ask enrollees to pay a higher price for emergency room trips that the state determines to be non-urgent. Indiana implemented this type of policy in 2015, and the Trump administration recently approved a request from Kentucky to do the same. Beginning in July, Kentucky will charge Medicaid enrollees $20 for their first “inappropriate” emergency room visit, $50 for their second, and $75 for their third. All of these policies suggest a new and controversial strategy for reining in health care costs: asking patients to play a larger role in assessing their own medical condition — or pay a steep price. 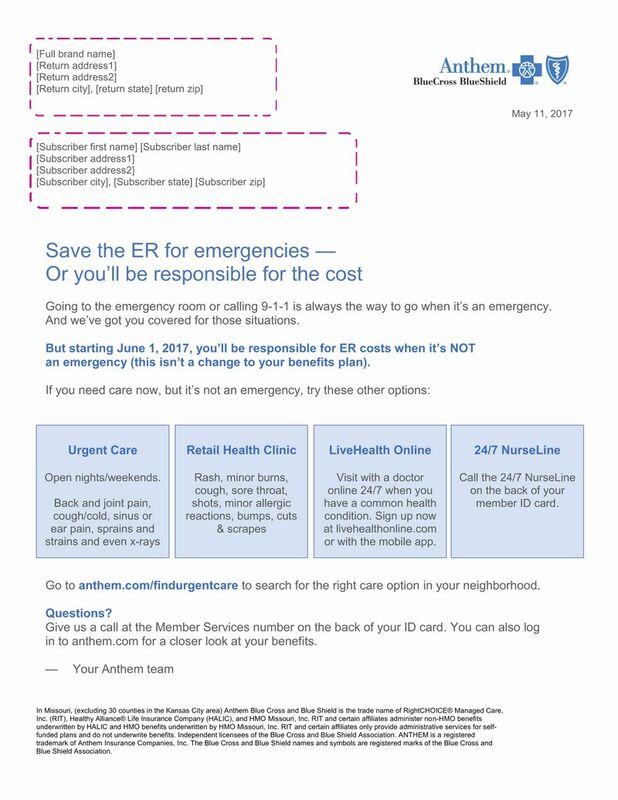 Vox looked into Anthem’s practice of denying emergency room visits as part of a year-long project on emergency room billing. The series has previously explored rising emergency room prices. It relies on a database of readers’ own emergency room bills. If you have one to share, you can submit it here. Anthem initially agreed to an interview on its new policy and Cloyd’s case, but a spokesperson canceled the day before it was scheduled to take place. Instead, the insurer provided a statement and declined to answer more specific follow-up questions. “Anthem’s goal is to ensure access to high-quality, affordable health care, and one of the ways to help achieve that goal is to encourage consumers to receive care in the most appropriate setting,” the insurer said in its statement. Emergency room doctors and patients argue that these new policies can often deprive patients of needed care and deter them from using emergency services in the future. They worry that other insurance plans may follow the lead of Anthem, a giant in the industry with more than 40 million members. Members of Congress and state regulators are pressing Anthem for additional information about how the policy works and which type of visits no longer receive coverage. Jonathan Heidt learned about Anthem’s new policy last June. He’s the president of the Missouri chapter of the American College of Emergency Physicians and was at the group’s monthly meeting when Anthem representatives came in to make a presentation. The Anthem denial policy would not cover “non-emergent ailments” seen in the emergency room. It would, however, exempt patients younger than 15, visits that occur over the weekend, and visits from patients who live 15 miles or farther from an urgent care center. A month earlier, in May 2017, Anthem had sent a letter to its thousands of Missouri members warning of the change. A letter from Anthem to Missouri members in May 2017. The letter suggested going to an urgent care center for “back and joint pain” and visiting a retail clinic for “minor allergic reactions, bumps, cuts & scrapes.” It also advertised Anthem’s own online doctor visits and 24/7 nurse hotline. An Anthem spokesperson said that the health plan uses both diagnostic codes as well as medical records in their review process. Anthem’s policy appears to be targeted toward pushing patients not to go to the emergency room when they have an injury or illness that could be treated elsewhere. That can hold down premiums for everyone, as emergency room visits are expensive — and, as the last story in this series revealed, prices in emergency rooms have increased rapidly in recent years. It is hard to know how many visits are “avoidable” or “non-emergent.” Studies have estimated that anywhere between 4.8 and 90 percent of emergency room visits are “avoidable,” depending on the criteria and methods used. Emergency physicians tend to cite the lower numbers, arguing that unnecessary trips to their department are few and far between. Insurers, however, often gravitate to the higher numbers that indicate they’re massively overpaying for routine care that could be delivered elsewhere. The topic can be especially difficult to study because it often requires understanding initial symptoms — chest pain, for example, could be a heart attack or indigestion. Many studies, however, only rely on the final diagnosis. A list of codes from Missouri is significantly longer, with more than 1,900 diagnostic codes that could indicate non-emergency visits. The list includes multiple types of “unspecified injuries” and “chest pain on breathing.” When asked about the Missouri list, an Anthem spokesperson said the latter diagnostic code regarding chest pain has since been removed from the list, which has been updated and revised. In other states, the list of diagnosis codes remains confidential. Georgia insurance regulators have asked Anthem to provide a copy of that state’s list, but so far, that hasn’t happened. There are no current estimates of how many patients the Anthem policy has affected, or what results it has achieved for the health insurance plan in deterring unnecessary visits. Anthem declined to provide such figures, only saying denials represented a small percentage of claims. Cloyd was shocked when she received the denial notice. She immediately got to work appealing the decision. Anthem reviewed Cloyd’s appeal two months later and, once again, denied coverage for the visit. Anthem wrote that it did not have sufficient medical records from her hospital. The hospital told Cloyd they had sent the health plan all the necessary documents. Cloyd made a second appeal. One week after Vox interviewed Cloyd about her emergency bill and inquired to Anthem about its emergency billing practices, Cloyd received a letter stating that the denial would be reversed — she had won her second appeal. Emergency room physicians are currently exploring what options they may have to push back against Anthem’s new policies. A meeting between the health plan and the American College of Emergency Physicians took place in Washington last December but yielded few results. Rogers said his group is looking at possible lawsuits or legislation, at either the state or national level. Right now his group is focused on collecting patient stories to get a sense of what the denial policy looks like on the ground. The experience completely changed how Cloyd thinks about the emergency room. She would still take her 7-year-old daughter in case of emergency, but she says she no longer thinks she’d ever seek emergency care unless forced by a medical provider.